There is something profoundly wrong with the way that we currently name and treat certain human phenomena. When we call something a “mental disease” or a “mental disorder” we imply a great deal about its origins, its treatment, its intractability, and our ability to control it. The mental health industry has its reasons for calling life’s challenges “disorders” but we have few good reasons to collude with them. In fact, the word depression has virtually replaced unhappiness in our internal vocabularies. We feel sad but we call ourselves depressed. Having unconsciously made this linguistic switch, when we look for help we naturally turn to a “depression expert.” We look to a pill, a therapist, a social worker, or a pastoral counselor — even if we’re sad because we’re having trouble paying the bills, because our career is not taking off, or because our relationship is on the skids. Even if our sadness is rooted in our circumstances, social forces cause us to name that sadness “depression” and to look for “help with our depression.” People have been trained to call their sadness “depression” by the many forces acting upon them, from the mental health industry to mass culture to advertising. Chemicals have effects and they can alter a human being’s experience of life. That a chemical called an antidepressant can change your mood in no way constitutes proof that you have a mental disorder called depression. All that it proves is that chemicals can have an effect on mood. There is a fundamental difference between taking a drug because it is the appropriate treatment for a medical illness and taking a drug because it can have an effect. This core distinction is regularly obscured in the world of treating depression. Psychotherapy, too, can help remediate sadness for the simple reason that talking about your problems can help reduce your experience of distress. Psychotherapy works, when it works, because the right kind of talk can help reduce a person’s experience of unhappiness. To put it simply, chemicals have effects and you may want those effects; talk can help and you may want that help. Antidepressants and psychotherapy can help not because they are the “treatment for the mental disorder of depression” but because chemical have effects and talk can help. By taking the common human experience of unhappiness out of the shadows and acknowledging its existence, we begin to reduce its power. At first it is nothing but painful to say, “I am profoundly unhappy.” The words cut to the quick. They seem to come with a life sentence and allow no room for anything sweet or hopeful. But the gloom can lift. It may lift of its own accord — or it may lift because you have a strong existential program in place whereby you pay more attention to your intentions than to your mood. What is an existential program? It is people taking as much control as possible of their thoughts, their attitudes, their moods, their behaviors, and their very orientation toward life and turning their innate freedom into a virtue and a blessing. Even if people decide to take antidepressants or engage in psychotherapy to get help with their unhappiness, they will still have to find ways of dealing with their meaning needs, the shadows of their personality, their consciousness of mortality, and the facts of existence. You accept and embrace the fact that you are the final arbiter of your life’s meaning. With this approach to life, each day is a project requiring existential engineering skills as you bridge your way from one meaningful experience to the next. By accepting the realities of life and by asserting that you are the sole arbiter of the meaning in your life, you provide yourself sure footing as you actively make meaning. 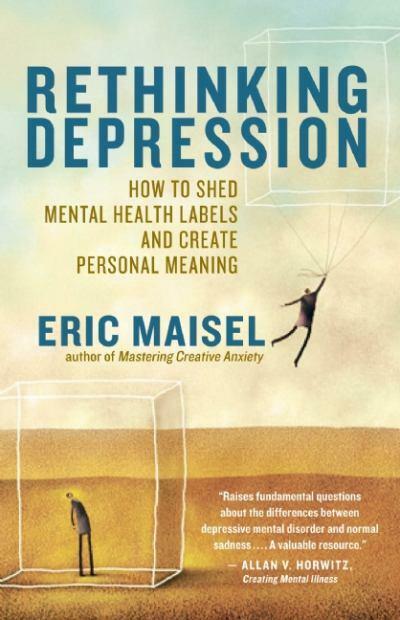 If we can begin to move from the “depression is a mental disorder” model to the idea that human beings must deal more effectively with the realities of human existence, including the realities of sadness, despair, and grief, we will have taken a giant step away from “medicalizing everything” and toward lives lived with renewed passion, power and purpose. Note: Anyone who is experiencing anything on the spectrum from serious sadness through major depression should seek out the help of mental health professionals because the chemicals, talk, and procedures they offer can have positive effects; but be sure to seek them out as an aware buyer of a certain sort of professional service.